– Scroll Popup Notifications for visual composer lets you add the popup notifications to your pages/posts/products/ other. Notifications are shown on page load, when scrolling the page to a certain length, the popup is displayed under the icon. You will customize content display popup by Visual Composer. – There are 2 options for popup notification display : All page (show all page) or Custom (page, post, product, other,..)…You just select the display template corresponding to the option you choose…. + Option to set width of popup. + Option to set background of popup. + Option to set border of popup. + Option to set position of the popup. 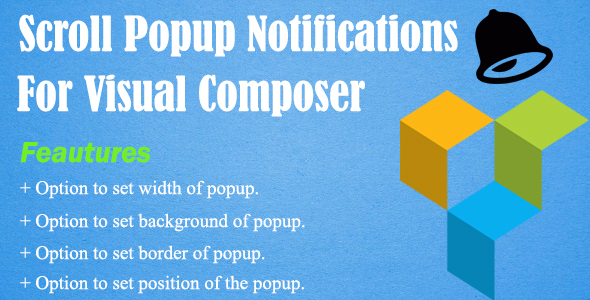 – Popup support any kind of content (use visual composer). – Optional popup window background, text color, background color , width. – Multiple notification, you can add a unique notification for posts or pages or products or another.